References csurface, synfig::CairoSurface::is_mapped(), and synfig::CairoSurface::unmap_cairo_image(). References synfig::ValueBase::get(), synfig::ValueBase::get_type(), IMPORT_VALUE, IMPORT_VALUE_PLUS, synfig::Layer_Composite::set_param(), and synfig::type_real. 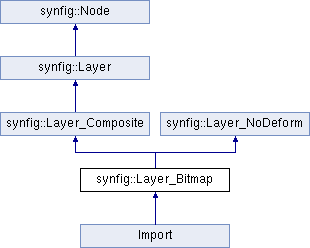 References synfig::CAIRO, EXPORT_VALUE, synfig::Layer_Composite::get_param(), synfig::ValueBase::set(), synfig::SOFTWARE, and synfig::type_integer. References synfig::Color::alpha(), synfig::Color::blend(), synfig::Color::BLEND_STRAIGHT, and synfig::Context::get_color(). References synfig::CairoColor::alpha(), synfig::CairoColor::blend(), synfig::Color::BLEND_STRAIGHT, synfig::CairoColor::demult_alpha(), and synfig::Context::get_cairocolor(). References synfig::ValueBase::get(), param_br, and param_tl. References synfig::Context::accelerated_render(), synfig::ProgressCallback::amount_complete(), synfig::Color::BLEND_STRAIGHT, synfig::ValueBase::get(), synfig::Layer_Composite::get_amount(), synfig::Layer_Composite::get_blend_method(), synfig::RendDesc::get_br(), synfig::RendDesc::get_h(), synfig::RendDesc::get_tl(), synfig::RendDesc::get_w(), height, left, mutex, param_br, param_c, param_gamma_adjust, param_tl, RENDER_TRANSFORMED_IF_NEED, synfig::Surface::alpha_pen::set_blend_method(), surface, top, trimmed, and width. References synfig::Context::accelerated_cairorender(), synfig::ProgressCallback::amount_complete(), synfig::Color::BLEND_STRAIGHT, cairo_paint_with_alpha_operator(), csurface, f, synfig::ValueBase::get(), synfig::Layer_Composite::get_amount(), synfig::Layer_Composite::get_blend_method(), synfig::RendDesc::get_br(), synfig::CairoSurface::get_cairo_image_surface(), synfig::RendDesc::get_h(), synfig::RendDesc::get_ph(), synfig::RendDesc::get_pw(), synfig::RendDesc::get_tl(), synfig::RendDesc::get_w(), synfig::CairoSurface::is_mapped(), mutex, param_br, param_c, param_gamma_adjust, and param_tl. References synfig::ValueBase::get(), synfig::Context::hit_check(), param_br, and param_tl. Referenced by Import::set_param(), Import::set_render_method(), and Import::set_time(). References csurface, synfig::error(), synfig::CairoSurface::map_cairo_image(), and synfig::CairoSurface::set_cairo_surface(). Referenced by accelerated_cairorender(), accelerated_render(), get_bounding_rect(), and hit_check(). Referenced by accelerated_cairorender(), and accelerated_render(). Referenced by accelerated_render(), Import::set_param(), and Import::set_time(). Referenced by accelerated_cairorender(), set_cairo_surface(), Import::set_param(), Import::set_time(), and ~Layer_Bitmap().